Tonight Julia and I went to the grocery store with the plan to spend a tranquil night at home in the piso. No wine. After a week of visitors, followed by a brief pause, followed by a surprisingly delightful visit from a Californian woman and a sevillana (both with very good taste), I had tallied an alarming number of nights out on the town, cruising from bar to bar, wine and more wine. My body told me it needed a rest. On the upside, so many nights out on the town gave me some great sparks of inspiration to work with. Shopping at a Spanish grocery store is an exercise in gluttony for anyone with the slightest interest in food, and especially so for someone more accustomed to Publix then Eroski. The idea of a puré as a base is ubiquitous in the finer dining spots in town, and sauces (creamy, tomato-based, whatever) are even more common. The Basques know what they have in the pimiento del piquillo, which really has no equal in even the most tender red bell. They love to stuff it with anything and everything...and a certain potato chip basket filled with small diced veggies and topped with a quail egg got my mind a working. Hence...one of the most delicious dishes I have ever, ever cooked. The cheesy sauce melts all over the potatoes, and the peppers light up the other veggies. Mmmmm. Die. Heat pot of salted water to boiling, cook potatoes until tender, 20-30 min. Meanwhile, heat olive oil over high heat. Saute eggplant, until tender, seasoning to taste with salt and pepper. Wipe pan clean, heat more olive oil, saute garlic and shallots for 30 seconds, then add remaining vegetables, seasoning with salt and pepper. Saute until very tender, about 15 minutes. Mix with eggplant. Stuff mixture into peppers. Pass potatoes through food mill and immediately mix with butter and garlic. Whisk in boiling milk until consistency is thin. Heat cream, seasoning with a touch of salt and pepper, then whisk in camembert. 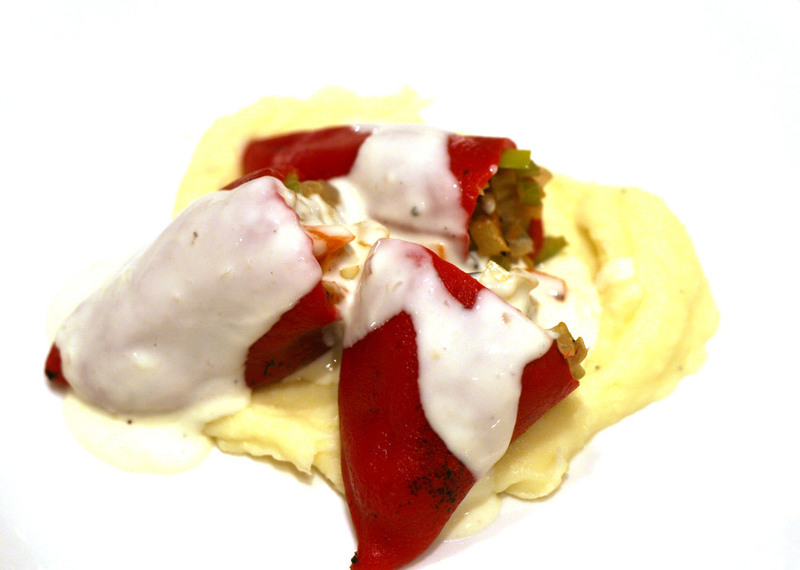 Smear plate with generous serving of potato puree, top with four peppers, and pour half of the camembert sauce over the top. Die.